"Did you see what I saw?!?" 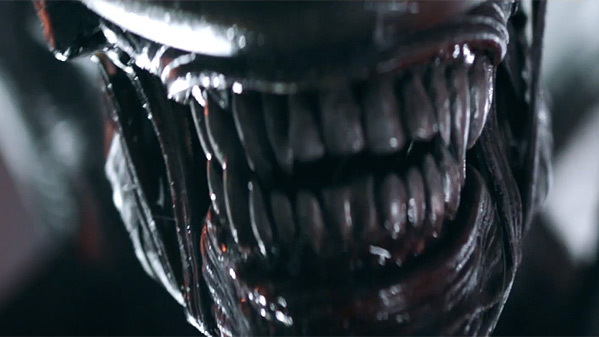 20th Century Fox has debuted another official red band trailer for their new set of six Alien Universe shorts. These were created to celebrate the 40th anniversary of Ridley Scott's Alien, first released in May of 1979, and will be released one-by-one every Friday starting tomorrow (March 29th). Fox partnered with crowdsourced studio Tongal and took submissions from fans who wanted to make their own Alien shorts. They received over 550 entries, and only six lucky filmmakers were chosen to bring their stories to life. This trailer goes through each of the shorts one-by-one to give us a look at them and a small glimpse of what we'll be seeing. Following Netflix's Love, Death & Robots anthology of shorts, I'm incredibly excited to see these. And I'm very happy that short films like these are being made and promoted by studios. You can still watch the first teaser trailer for Fox's new Alien Universe shorts here, to see the original reveal. Thanks to Bloody Disgusting for the tip. Description from YouTube: "To celebrate the 40th anniversary of Ridley Scott's groundbreaking sci-fi horror film Alien (1979), six visionary filmmakers (above) were selected to bring their Alien-inspired stories to life. From terrifying escapes, to Facehuggers and Xenomorphs, these captivating shorts brings forth an exciting new narrative for fans while paying homage to the original film." Featuring six different shorts by: Chris Reading (Alien: Containment), Benjamin Howdeshell (Alien: Harvest), Noah Miller (Alien: Alone), Aidan Breznick (Alien: Night Shift), Kelsey Taylor (Alien: Specimen), and the Spear Sisters (Alien: Ore). Ridley Scott's original Alien was first released in theaters on May 25th, 1979. One new short will be released every Friday on IGN, beginning March 29th this month.